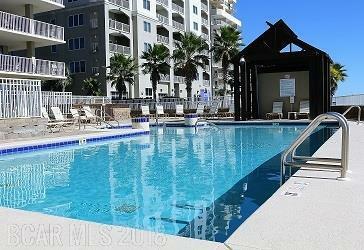 This luxurious 3 bedroom/3 bath Gulf front east corner condo is a must see. Relax with a cocktail and enjoy the wonderful sunsets on the HUGE wrap around balcony that you can access from the dining area, the living room or the master bedroom. You and your guests will be amazed by the beautiful view from the 11th floor in Unit 1101 through the brand new windows and sliding glass doors! This is a top floor unit! You can enjoy the BEAUTIFUL gulf view from the Master en suite with 2 brand new sliding glass doors that face the gulf. This room also has a TV / VCR combo. The EXTRA LARGE master bath features a double vanity and over sized tub/shower. The 2nd bedroom has a private bath and the 3rd bedroom has a private access to the main bathroom. This room also features its own private balcony with sliding glass door. The FULLY EQUIPPED NEWLY REMODELED kitchen has granite counter tops. There are 4 seats at the bar and the glass top dining room table also seats 4. In the living room area, you will be delighted with the 32 inch flat screen tv and DVD player. There is also an oversize sofa to enjoy sitting back and watching tv or listening to the peaceful sound of the waves with the open sliding glass doors. Laundry room contains a full size washer and dryer. Outdoor pool, indoor heated pool, sauna, hot tub and exercise room. There are convenient restrooms located by the indoor pool area. There are stainless steel charcoal grills located by the pool area with enough room to pull up chairs and have an outdoor BBQ. Over $35,000 on the books for 2018, did $52,244 in 2017! See 2017 and 2018 rental history in "documents"